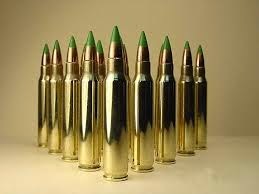 Congressional Democrats are pressuring the Obama administration to move ahead “swiftly” with a proposal that would ban a form of armor-piercing ammunition. “We hope that the Bureau will swiftly review comments on the proposed framework and issue a revised proposal that will address the danger posed by handguns that fire 5.56mm and other rifle ammunition,” Democrats write in the letter. The ATF had sought to prohibit gun companies from manufacturing or selling 5.56 mm projectiles for M855 cartridges, arguing they are a threat to law enforcement officers because they can be used in handguns. But the proposal generated a firestorm of opposition from Republicans and gun groups, who denounced it as an attack on the Second Amendment that could open the door to sweeping restrictions on ammunition. House Democrats in their letter say they are “very disappointed” that the ATF delayed the rule.